Tonight, ABC swaps Brat Camp for Peter Jennings: Reporter, a two-hour special honoring the work of the late anchor. Jennings died Sunday at 67, presumably due to complications from lung cancer. Today's Boston Globe suggests ABC News will not try to reinvent the wheel when replacing Peter Jennings. The article suggests likely candidates include the cohost of Good Morning America Charles Gibson and globetrotting reporter Bob Woodruff are the leading candidates. Elizabeth Vargas also gets a mention as a dark horse. The article also mentions that the stature and importance of the newscast isn't what it was, making the appointment "a great job" but not "an iconic job". The days of the Big Three anchors are surely done. Olbermann At Odds With MSNBC Again? Is Keith Olbermann in trouble with his boss again? After eulogizing Peter Jennings with a graphic description of a cancer scare of his own, he might be. Read all the details from Lloyd Grove in the NY Daily News. After scoring huge numbers for its debut, last week's episode of FX's Over There shedded over a third of its audience. Why? Did viewers not like what they saw? Did it hit too close to home? Was it too graphic? Or was it just an anomaly? FX honchos aren't concerned- yet. And critical praise has been good, so they're going to wait and see. And advertisers are digging the demos- last week's episode had an average viewing age of 38. This is the point of the entry where I usually weigh in with my opinion, but I STILL don't get FX. So instead, I'll insert my standard "Cablevision blows" line and move on. 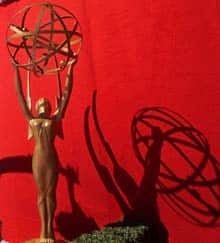 Emmy organizers decided to scrap their plan to force winners in writing and directing categories to pre-tape their acceptance speeches. Academy officials pre-taping remarks from dozens of nominees proved a difficult and expensive task. Many of TV's top producers and directors hated the idea anyway- big surprise. The plan, announced in April, was an attempt to speed up the show. The Primetime Emmy Awards telecast airs next month on CBS. MTV's The Real World- inexplicably still on the air- will head to Key West, Florida for its 17th season, opening up plenty of opportunities for scantily clad reality wannabes. It will begin shooting this fall, and air early next year. I'll be sure to check my TiVo to make sure I can't give this show any more than three thumbs down. 10. Law & Order, NBC, 8.7 million. ABC Family's Beautiful People found 1.6 million total viewers, tying the channel's highs for original series among 18- to 34-year-olds. Comedy Central's Too Late With Adam Carolla drew 652,000 viewers, keeping less than half of the audience from its Daily Show lead-in. TNT's The Closer locked up its biggest audience since its debut with 6.1 million viewers on Monday, while flipping the bird to the Peacock and other broadcast networks: it beat NBC, the WB and UPN among total viewers.